In a lab just outside of Barcelona, tiny particles are arranging themselves into ordered 3-D structures, like little animated Lego bricks clicking themselves into place. These particles are highly porous organic-inorganic hybrids whose size and shape can be controlled to tune the properties of the resulting ensemble. Self-assembly has long been ubiquitous in chemistry, materials science and biology, but it emerges now as an efficient route to a range of materials with uniform structures, particularly at the nanoscale. 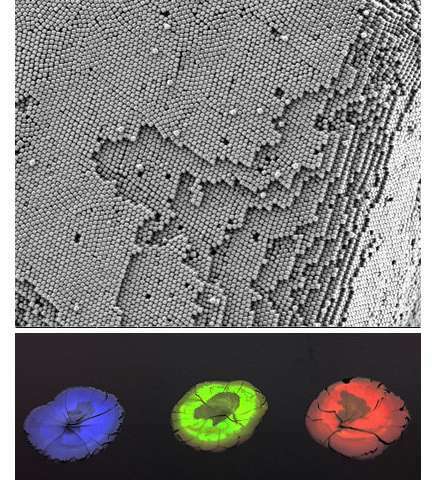 Many studies to date have reported the synthesis of polymeric and metal-based particles that spontaneously self-assemble into ordered 3-D superstructures. Today, researchers at the Catalan Institute of Nanoscience and Nanotechnology (ICN2) and the Institute of Materials Science of Madrid (ICMM-CSIC) present their findings in relation to hybrid metal-organic particles, adding metal-organic frameworks (MOFs) to the list of compounds that can be synthesised for 3-D self-assembly. Cannonballs pile up easily thanks to their shape, fitting into place regardless of their orientation. Bricks, however, need to be aligned the right way to create an orderly pile. When this is carried out at the nanoscale, the problems are the same. A condition for this stop-motion Lego effect is that all synthesised particles present the same size (monodispersity) and shape, so that when they click into place, the resulting arrangement is well-ordered, well-packed and functional. Until now, this had never been achieved for crystalline hybrid compounds like MOFs, despite their polyhedral geometries. But in this latest work, published this week in Nature Chemistry, Spanish researchers report the successful synthesis of MOFs "ZIF-8" and "UiO-66" with the required homogeneity of size and shape. The resulting 3-D superstructures, made up of many billions of identical particles arranged into crystals several millimetres across, present properties typical of photonic crystals, a promising new material for the manipulation of light. As such, the new structures scatter light in a way that provides colour without the use of pigments or dyes, known as structural colour. Furthermore, by controlling the size and shape of the particles at synthesis, researchers can tune the material's photonic band gap to determine what colour is achieved. Built from MOFs, the new structures also boast high porosity, a feature that can be exploited in sensing applications. Different substances adsorbed into the pores cause the light to be refracted into different colours. This effect can be tuned such that a given colour indicates the presence of a given substance. The ability to form 3-D superstructures from porous units also opens the door to applications based on the alignment of the pores on a large scale, for instance, to produce improved membranes for gas adsorption and catalysis.